Bur oaks (Quercus macrocarpa) shine against a cloudless October sky. The fleeting season of gold and blue arrived in central Minnesota last week. 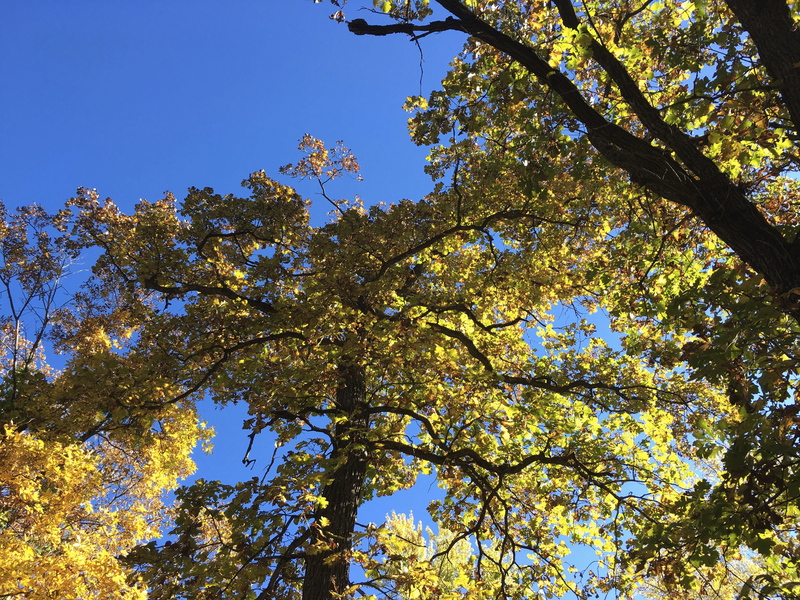 The golden hues of bitternut hickory, bur oak, aspen and ash glow against a sky the color of a newly opened morning glory — a shade unique to autumn. 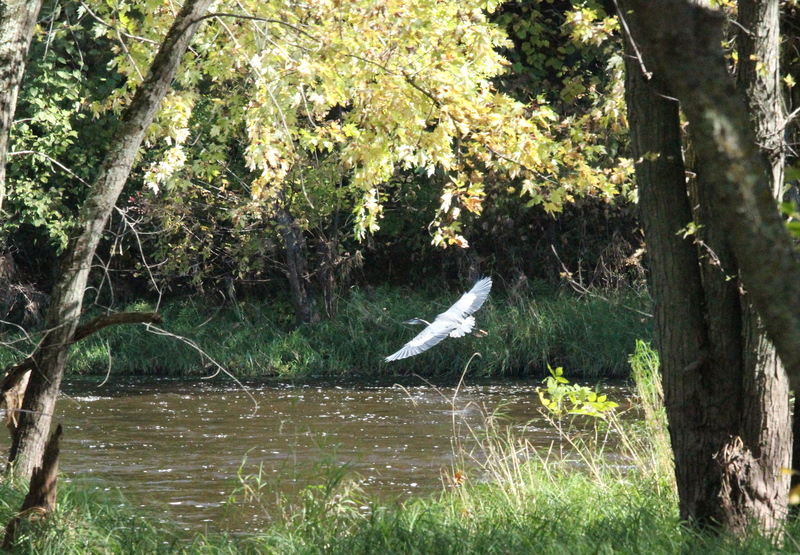 Along the Snake River in Pine County, MN, the steely blue-gray wings of a great blue heron swoop over the sparkling water. A great blue heron (Ardea herodias) swoops over the Snake River in east central Minnesota. 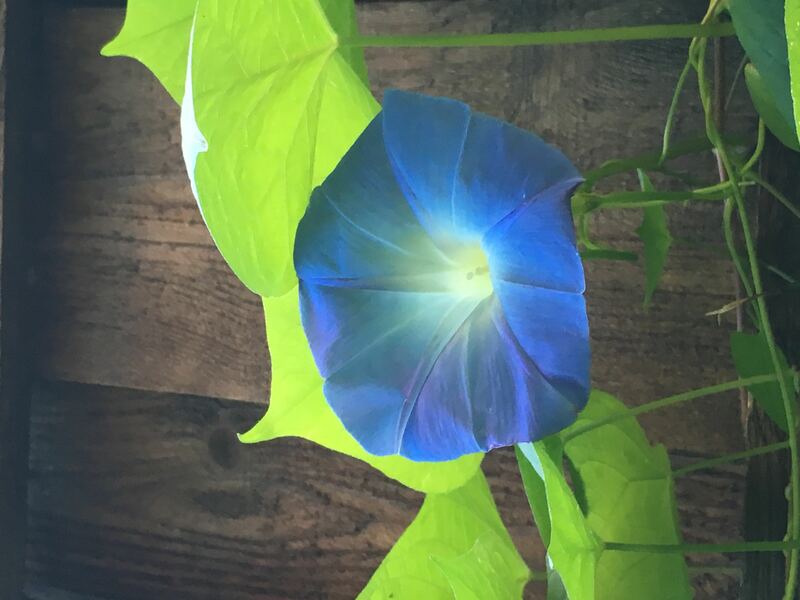 Heavenly blue (Ipomea purpurea) morning glories continue to bloom in October. Closer to the ground, the last of the powder-blue bottle gentians and asters — some with center disks as bold as the sun — bloom among the grasses. Fallen aspen leaves accent walkways, and the heart-shaped leaves of the carrion flower vine wind their tendrils skyward. In a few days, this lovely combination will dampen down to more muted tones, the gentle softness that insulates the earth for winter’s palette of black and white. 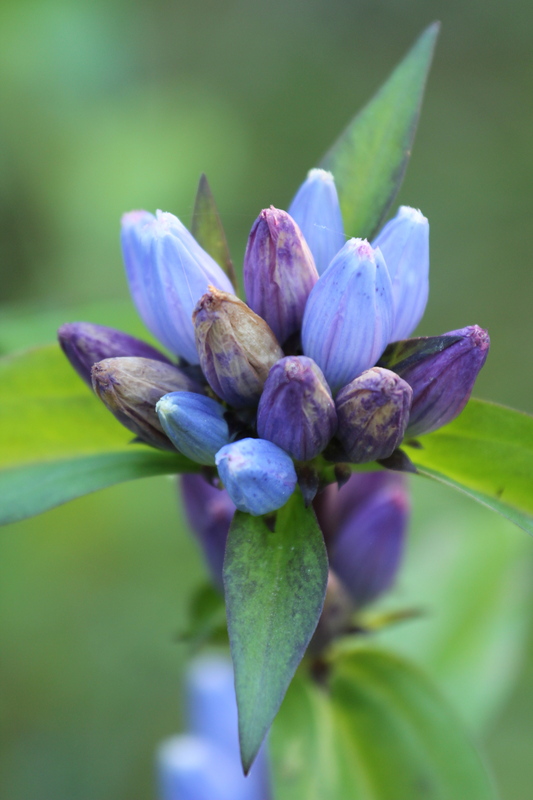 Bottle gentian blooms (Gentiana andrewsii) turn dark and dry out as their seeds mature. 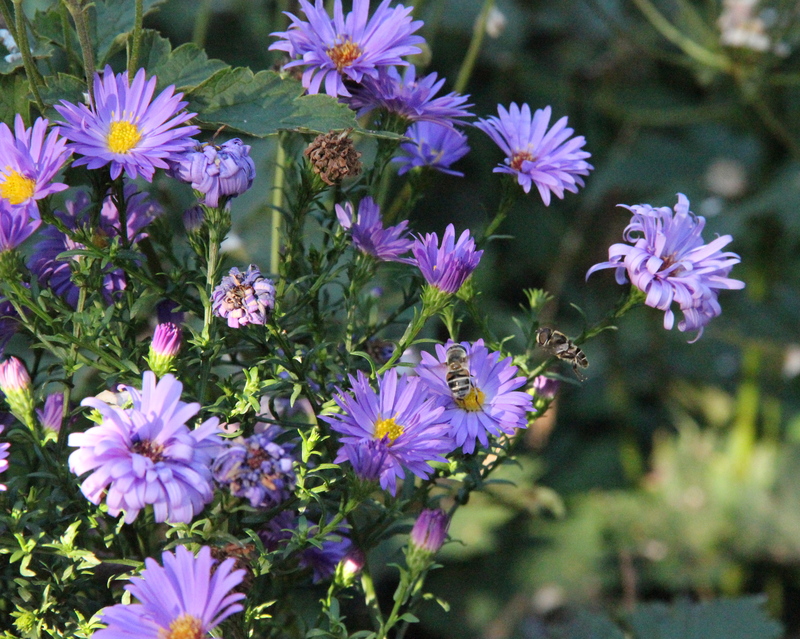 Asters (Symphyotrichum novi-belgii) provide nectar to these hoverflies, or syrphids, and many other autumn insects. 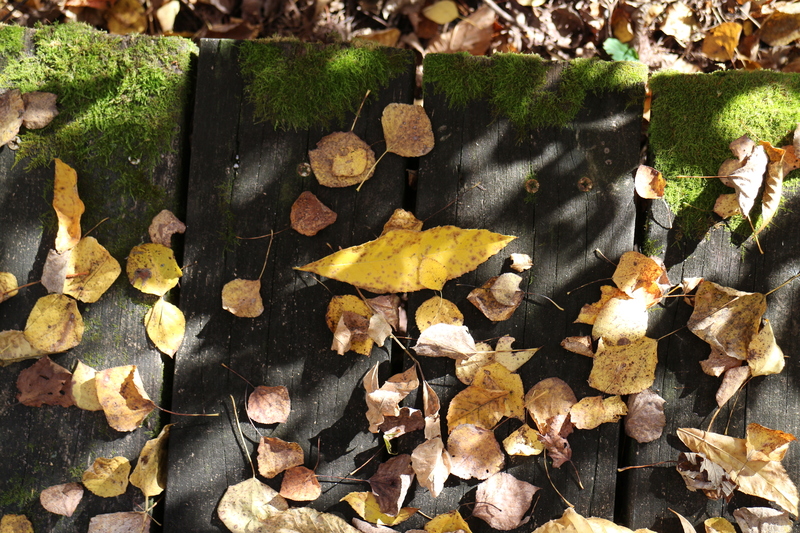 Quaking aspen leaves (Populus tremuloides) and moss decorate a walkway at our cabin. 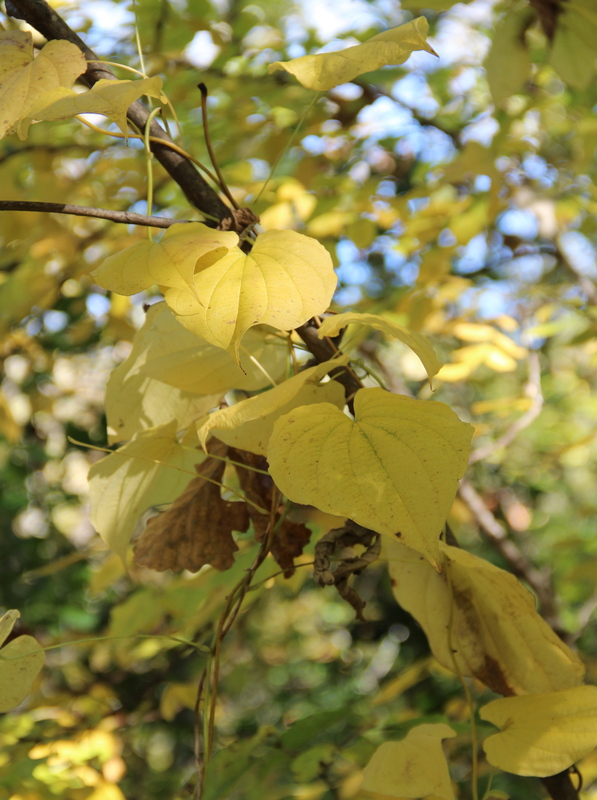 The heart-shaped leaves of the carrion flower vine (Smilax herbacea) add light and color to the October woods. Autumn meadowhawk dragonflies, which fly late into autumn, still patrolled the garden. The reddish-colored mature females, with clear wings tinted amber at the base and red spots at the top, added jewel-like color to the changing garden. 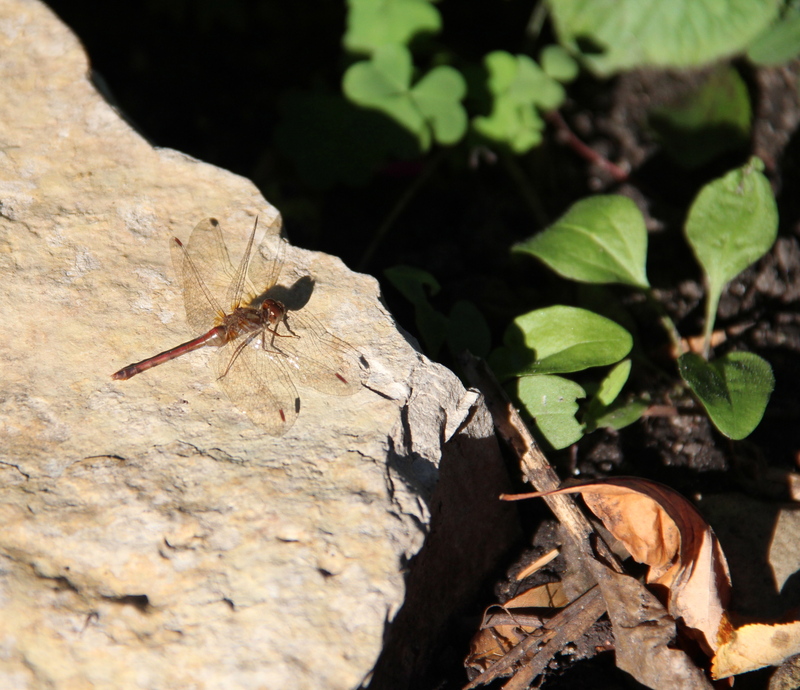 A female autumn meadowhawk dragonfly (Sympetrum vicinum) suns on a stone wall in the garden. 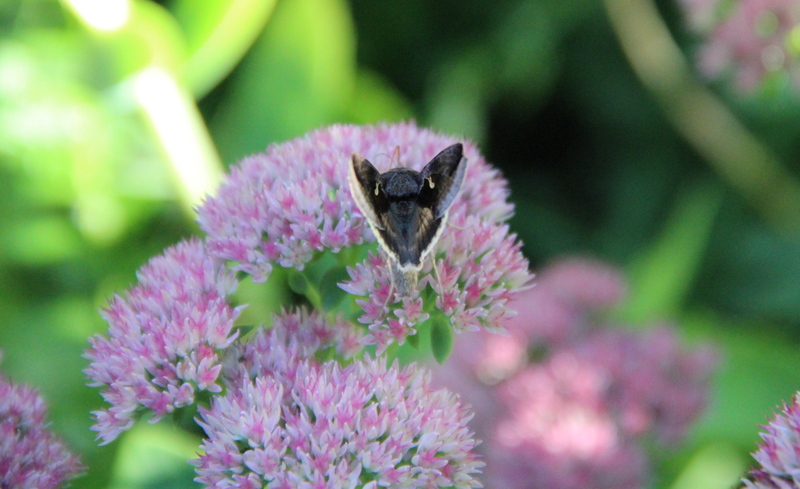 A celery looper moth visited the garden from morning until dusk each day for more than a week. Though it’s not colorful, the contrast between the chocolate-brown wings and the bright silvery-white curved markings makes it glow in the sunlight. Though looper larvae can be agricultural pests, the adults pollinate many varieties of plants. This one seemed to prefer Sedum ‘autumn joy’. 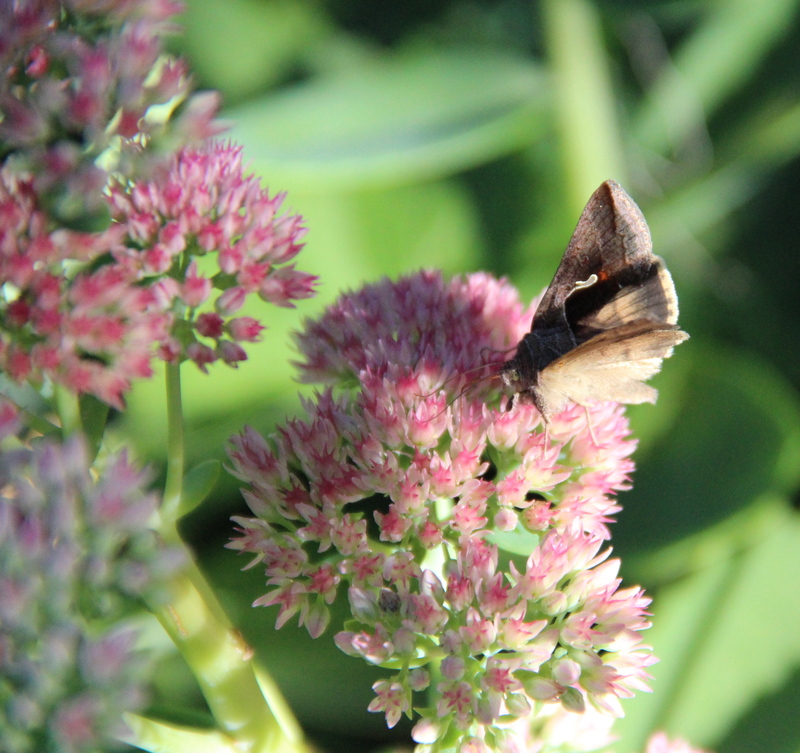 A celery looper (Anagrapha falcifera) nectars on Sedum ‘autumn joy’. Side view of a celery looper moth. Syrphid flies, also known as hover flies or flower flies, are small insects that zip between flowers much quicker than bees and wasps. Syrphid flies are bee and wasp look-a-likes, but they don’t sting or bite! Many species are helpful in the garden for two reasons: The adults pollinate flowers and the larvae eat aphids and leaf hoppers, which cause a lot of damage and disease in plants. They are called hover flies because they often hover in midair over the garden before zooming off in a new direction — sometimes flying backwards. They are known as flower flies for their pollinating presence in the autumn garden. 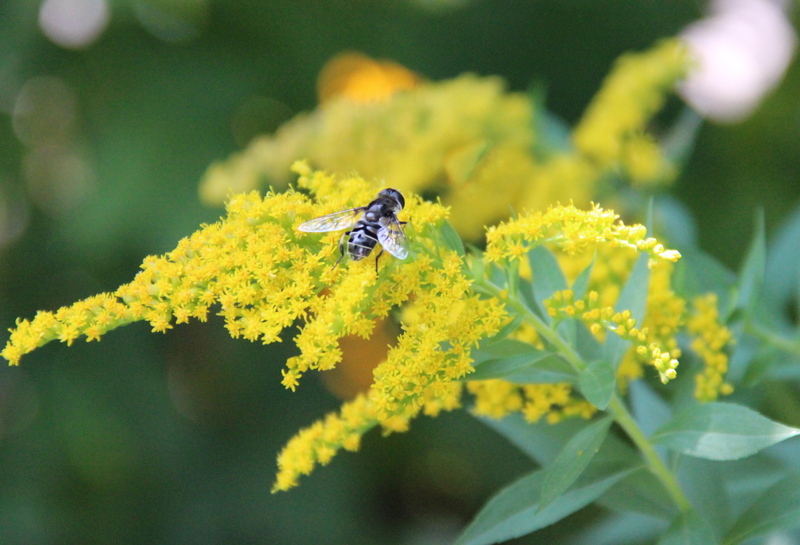 A syrphid fly, (Eristalis) pollinates native goldenrod. 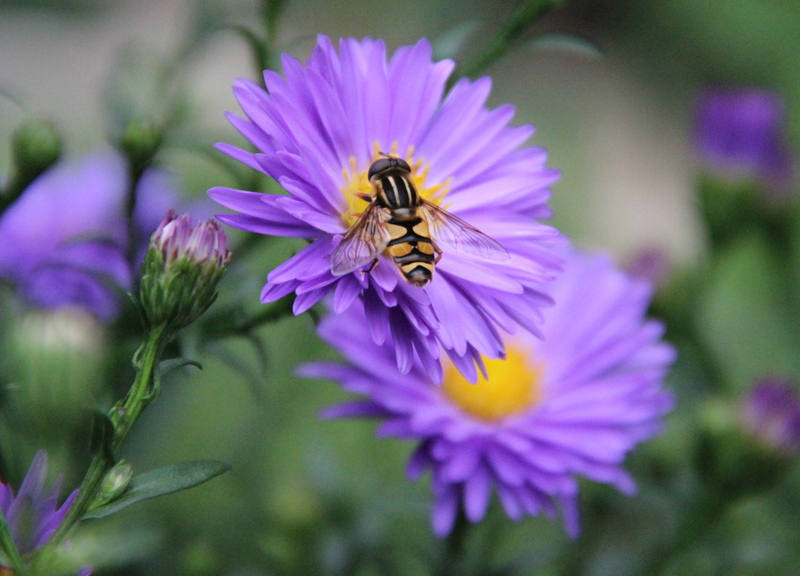 Another species of syrphid fly (Helophilus) pollinates garden asters. Hidden among the garden plants, an eastern chipmunk gathered seeds to store for winter use in its nearby den. There’s a stable chipmunk population in our urban neighborhood, in spite of many gardeners’ attempts to eradicate the rodents. At least the chipmunks retire to their dens until spring, unlike squirrels, which raid the garden during the growing season and the suet feeder during the winter months! 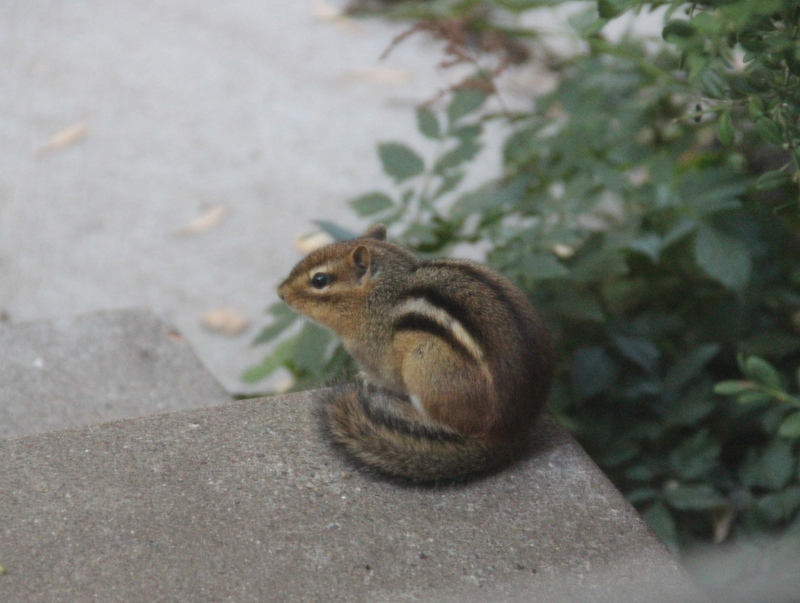 An eastern chipmunk (Tamias striatus) surveys the yard from its perch on our back steps. The backyard bird population is changing as many bird species migrate south. For example, most of the warblers, orioles and swallows have left; ruby-crowned kinglets, yellow-rumped warblers and white-throated sparrows are passing through from further north. Daily visitors to our garden, trees and hedges include northern cardinals, blue jays, American goldfinches, black-capped chickadees, white-breasted nuthatches, American robins and a brown creeper. I don’t have a telephoto lens yet, so I don’t photograph many birds. An excellent website with photos, key facts, bird calls and other information is allaboutbirds.org. Lastly, bumble bees and honey bees nectared on the Sedum ‘autumn joy’ and garlic chives. (Earlier in the summer, I pruned the sedum to different degrees so that it would continue to bloom late into autumn.) The sedum and asters were the main attraction for insects last week. I haven’t seen either bee species since the weather turned cold and rainy. I miss their industrious presence and look forward to their return next spring. 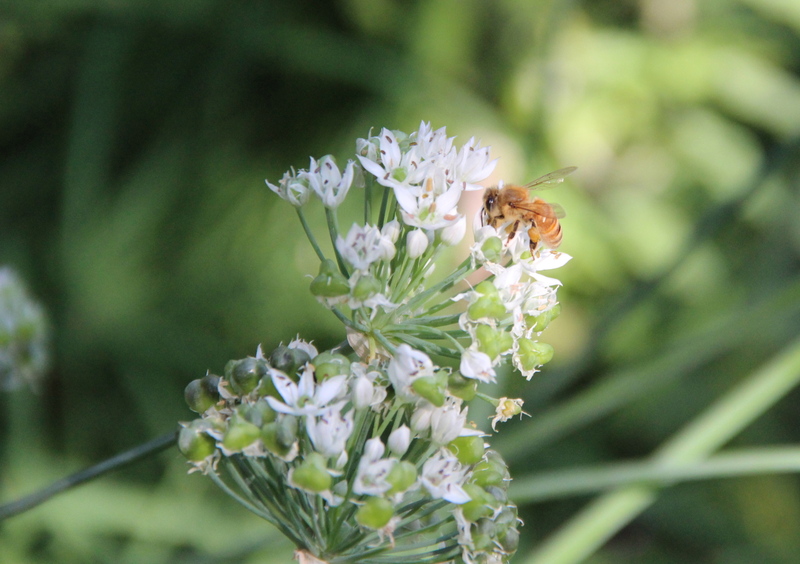 A honey bee nectars on garlic chive blossoms (Allium tuberosum). 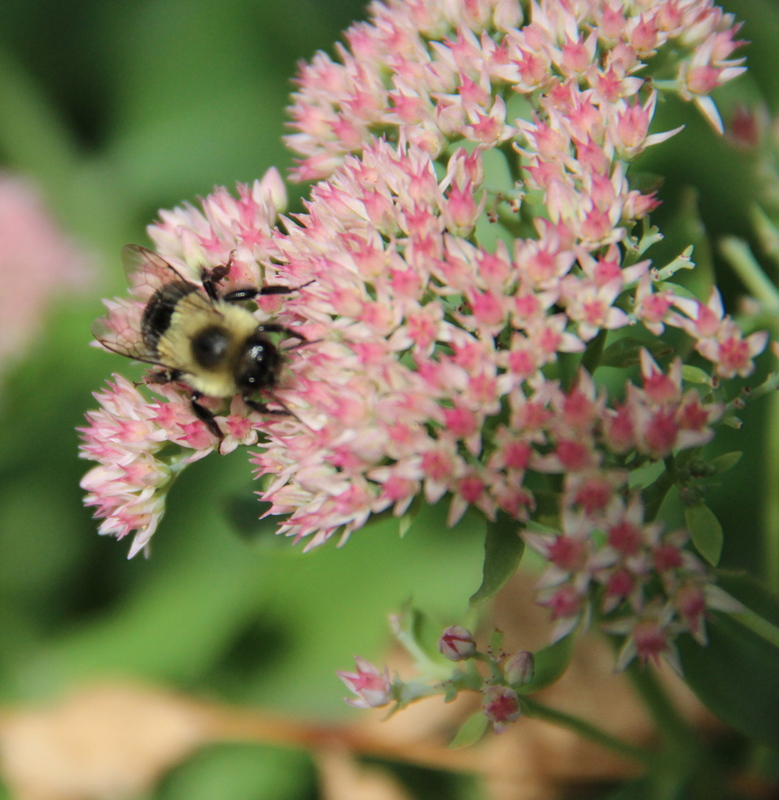 A bumble bee (Bombus impatiens) nectars on Sedum ‘autumn joy’.